I’m an Algerian secret agent – at least according to a raging Twitter troll I owned a few weeks back. This particular Twitter troll was a big fan of Morocco’s brutal occupation of Western Sahara. All too often critics of the occupation internationally are shut down by Moroccan propagandists. In countries where Western Sahara solidarity movements are growing, solidarity activists all too often complain of being heckled by supporters of the occupation. They disrupt public meetings, try to discredit human rights advocates, spread disinformation and just generally make a nuisance of themselves. This is a major problem for the movement for human rights in Western Sahara. Now, one troll has just been seriously trolled, after they tried to shut me down for sharing this article I wrote for teleSUR on Western Sahara. I have no idea who this Twitter user is, but they clearly didn’t seem to appreciate seeing an accurate depiction of conditions in Western Sahara. To understand just how succulent the below ownage was, you need to understand a little about Western Sahara. Hence, I’ve included some useful background at the end of this post. Just scroll past the trollfest to read up. If you already know all about Western Sahara, then dive straight into the ownage in all its glory! A few things to note: this isn’t the entire exchange, just a condensed version of a Twitter rage that took place over a few hours. CORCAS kept moving around on different threads, making it hard for me to collate everything in one place. There are also a few tweets missing that were either off topic, rambling or otherwise just not important enough to include here. In any case, I think the above is a pretty succinct overview of how things went down, and doesn’t at all misrepresent the conversation. If you want to see for yourself, check out my Twitter profile. Although the above Twitter rage is pretty funny, the situation in Western Sahara is no laughing matter. This forgotten corner of north-west Africa is one of the continent’s great modern tragedies, where human rights are flagrantly violated by Moroccan security forces, and hundreds of thousands of the territory’s Indigenous people live in abject poverty. Western Sahara was a Spanish colony until the 1970s, when Spain was pressured to grant it independence. But, as the Spanish evacuated the territory, it was invaded by its neighbors, Morocco and Mauritania. What ensued was a three-way, decades long war between Morocco, Mauritania and an Indigenous independence movement, the Frente Polisario. The Polisario guerrillas beat back the Mauritanian invasion, and in the 1990s reached a U.N.-brokered ceasefire with Morocco. Under the terms of the ceasefire, the U.N. was supposed to organise an independence referendum. Since the overwhelming majority of Western Sahara’s Indigenous population, the ethnic Sahrawi, totally support independence, the Polisario thought it had just guaranteed Western Sahara would become an independent country. Fast forward two and a half decades, and the referendum still hasn’t happened. The U.N. mission is basically comatose, and Morocco has been left to occupy most of the territory with almost complete impunity. It’s a lousy situation, made worse by the fact that hundreds of thousands of Sahrawi have been languishing in refugee camps on the Algerian border for decades. 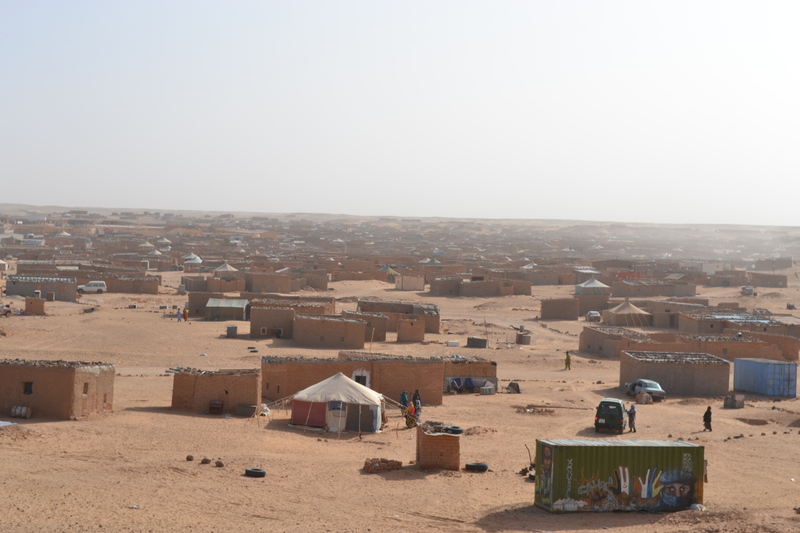 The refugee camps are administered by the Polisario’s proto-state, the Sahrawi Arab Democratic Republic (SADR), and receive humanitarian support from both the U.N. and Algeria. Geographically, SADR is little more than a thin strip of Western Sahara’s sparsely inhabited eastern desert. All of Western Sahara’s major settlements fall within Moroccan-held territory. Under the occupation, Sahrawi live in something like an apartheid state. Dissidents are treated as either terrorists, or Algerian spies. How do I know how bad things are? Because I’ve been there. Despite the human rights abuses, most Moroccans support the occupation. This is because the invasion of Western Sahara is heavily romanticised as a key chapter in the founding of the modern Moroccan state. Moreover, thanks to a total media blackout in Western Sahara, the rampant human rights abuses against the Sahrawi are almost totally unknown. The only Moroccans (apart from security forces) with any idea of what is really happening are the settlers in Western Sahara, who enjoy massive state subsidies to live on Sahrawi land. These Moroccan settlers have a strong economic incentive to maintain the status quo, much like Israeli settlers living in their West Bank enclaves. While the occupation is viewed as totally legitimate in Morocco, abroad it has been widely condemned. Few countries support Morocco’s territorial claim to Western Sahara, with much of the international community advocating for a referendum of independence. Most of Africa either supports the referendum, or outright backs SADR. Morocco even left the African Union over its stance on Western Sahara, making it the only African nation that isn’t part of the regional bloc.